I’m belatedly joining the One Small Change party initiated by Suzy at Hip Mountain Mama. She has invited people to make one small change each month to benefit the environment. We call it The Food Exchange, but really it should be called: “What your great-great grandmother did on a daily basis while herding ten dirt-smudged children but you can do one day a week and feel like a culinary goddess.” But that’s too wordy, so for now we’ll stick with The Food Exchange. My friend Audrey cooked up this idea. It’s like one of five-trillion shining ideas she’s brought to our community, including the carrot mob and the local babysitting co-op, (which means that as I write this my kids are partying it up at a friend’s house while no money is exchanged). Audrey figured there were enough Mamas regularly making bread, yogurt, cheese etc…why don’t we each pick one item, make an extra large batch and exchange each week? Truthfully, I wasn’t currently making any of these items. Rather, I was spending a king’s ransom on wheat-free loaves of bread, which after three quick days amounted to nothing more than a sorry, lone heel in the bottom of a plastic bag. 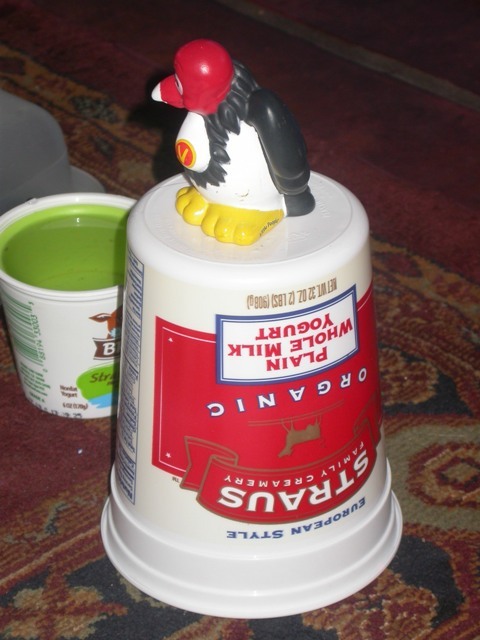 Also, I was sheepishly stacking plastic yogurt containers into a rising tower of petroleum-products, creating my own monument to landfills. They *are* handy when you need a mountain for your vulture. 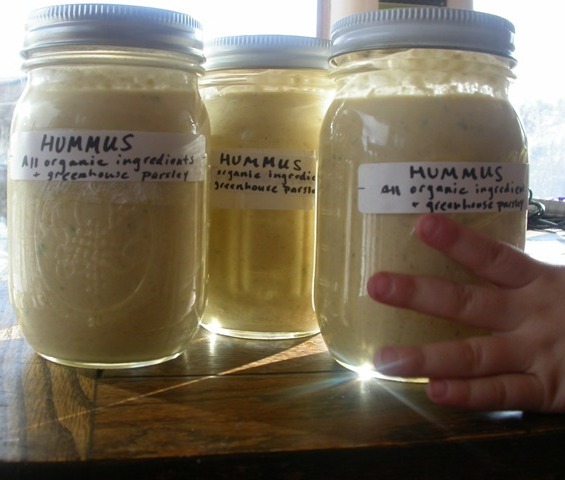 The first week I made hummus, with enough extra to stash some in the freezer. Coincidentally, I had just received a letter from the natural parenting magazine that had retained, for TWO years, a piece I wrote on breastfeeding a preemie, stating that my essay no longer suited their needs. Needless to say, my ego was slinking around, kicking imaginary dogs. Somehow, making this hummus with my daughter—who was thrilled to be my assistant while her brother napped—lifted my mood. Maybe it was this face. Maybe it was just the simple act of spinning raw ingredients into such deliciousness. For our first actual exchange, the three participating families met at Sheryl’s. The assorted kids pieced together train tracks, completely oblivious to the inaugural moment at hand, while we Mamas unveiled our goods and chatted, covering ten topics in five minutes, as women can. “It’s like having three wives,” Sheryl’s husband commented. It was later established that Sheryl’s husband wouldn’t really want three wives, and why would he when he gets the homebaked goodies for free (I’m referring to the bread, obviously). It should be noted that the husbands are wildly supportive of the program, though haven’t volunteered to participate in the food prep, per se. Here’s Dan supporting the endeavor (that night for dinner we ate exactly what we received – bread, hummus and cheese. I thought about steaming some broccoli, but got distracted by the sheer joy of homemade cheese). With the stout, it's almost four food groups. This past month there’s been yogurt. Still Life with Yogurt and Dan's Sunday waffles. And can you see that cream on top? You can hear the cabbage, carrots and onions fermenting; this excites me. Except, next time no onions, remember? And cultured veggies, which turns out is an acquired taste and it also turns out that one should never add onions to ones cultured veggies. But when you ferment your own vegetables, you start feeling a bit like a mad professor, scouring the fridge for additions to your latest chemistry experiment. But really, this fermenting of vegetables is an ancient art, perpetuated to make vegetables last throughout winter, while packing a probiotic/enzymatic punch. 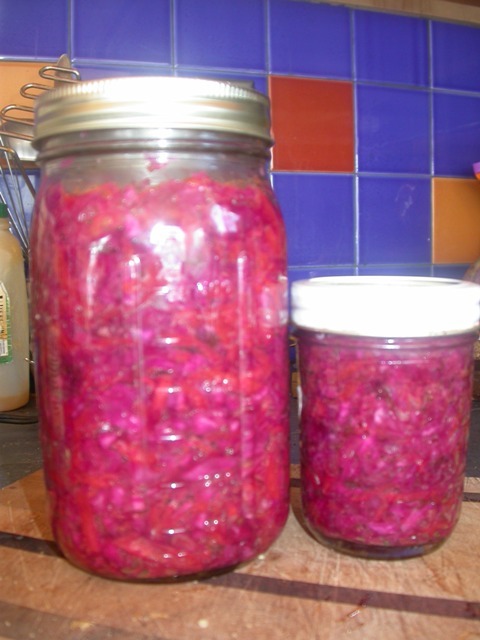 You may love growing a little patch of lactobacilli on your kitchen counter. You may even start to feel like you could heal the world with the probiotics you grew, or even channel your ancestors, or at least reverse some of the damage of your own pastry-habit. Of course we’re all very humble with each other. Audrey insisted that her bread was over-cooked, while Sheryl branded hers under-cooked. Given that both loaves were mere crumbs after two days, I don’t think our family noticed. I tried my hand at a loaf of spelt-flour bread last night and not exercising any humility, I told my family that if they gushed repeatedly over how delicious it was, I would make a loaf every week. I used this recipe (don’t be thrown by the Disney site, you can’t not fall in love with Catherine Newman’s writing and recipes), which is a no-knead recipe, only slightly more complicated than cooking up a box of mac ‘n’ cheese. The possibilities of the Food Exchange are limitless. I’m thinking granola, salad dressing, mustard, tortillas, lip balm (which Rose would argue is a food). I love that this simple idea builds community, reduces waste, saves money and encourages exploration of the lost kitchen arts. Sheryl, Audrey, me, and Steph (our new recruit) with baby Jordan. Do your parties include sippy cups and wine? PS: Happy March! Not that any of us have been desperately pining for this month that holds as much promise as payday. ooooh – I love this idea. I’m going to have to steal it and do it up where I live. home-made cheese? I’m so impressed. And of course, wine and sippy cups will totally be a must. Great ideas. I haven’t been buying yogurt due to the fact that I, too, can’t stand all those little containers piling up, and I have a yogurt maker. Perhaps I’ll make a batch today. I loved the babysitting idea~I’ve been trying to get that arranged in my little hood. Maybe I’ll get back on that today, too. Thanks for the inspiration! This is such a fabulous idea! And, yes, something that needs to be revived. Looks like you have an incredible group of gals and so nice to see the community you have created! Enjoy it!! This ROCKS!! In a hundred ways….. I love it….. Suddenly this *does* seem cool! Thanks for posting about it!! When I make yogurt, I end up with so much of it that it tends to go bad (can you freeze yogurt? I’ve been afraid to try). And bread baking would be great. Also, I adore Catherine Newman! Have a hard time handling that Disney site, though. This is a great idea. What a great way to connect good food with community! Wait, lip balm’s not a food?? Uh-oh. (But that hummus, boy, it looks tasty!) And making my own yogurt seems an impossibility around these parts, but I finally found a brand that uses a plastic that can be recycled. Not perfect, but better than where we were, right? Just like you said, One Small Change. I do a meal group where we each make four pans / dishes of something and then we exchange once a month so we have four frozen meals to pull out of our freezer…on nights when we don’t want to make a mess in the kitchen or spend hours slaving away. I love this idea … if I lived where I could participate you would get applesauce and strawberry freezer jam from me! That is great Rachel! Makes me wish I was still in Durango and could get involved in your group. I am so inspired by all these delicious foods you all are making. I’ve got to make my own cheese. Have you made tortillas before? I’d love to start making them myself – any good recipes to recommend? p.s. – our parties almost always include both wine & sippy cups! Michelle, How funny. I didn’t know that was YOUR blog I was commenting on. I was just drawn in by the mention of “local food.” Even the internet is a small world! I haven’t ever made tortillas, but I suspect I will be in the next month. Anyone else? I have, almost entirely unsuccessfully, alas. However I’m very happy to share my tortilla press and stories of (un)success with you. Maybe the lady who helps us keep the house clean would teach us! I am coming for breakfast. I will trade east coast-urban-parent of teenage girls “wisdom” (such that it is) for Dan’s waffles and that yogurt so beautiful that i drooled on my laptop. Babysitting coop was a godsend when the kids were little, keep it up! That looks like one HUGE change to me! Good for you Rach, you continue to amaze me (and make me feel like a useless drain on the environment… but I’ll keep trying)!! Sorry about your manuscript, that’s lame, but frees it up for someone else now!! Very inspiring Rachel. I happen to have kiefer yogurt coming out of my ears right now. Too good to waste (to me). And it never seems worth it to make a batch kimchee for just me. I like the food swap idea. On another note. What kid of bylaws does your babysitting coop have? This is great! I never had this kind of inspiration or support when I had “littles”. Bravo ladies! this is such a fabulous idea! i wish i were in your neck of the woods sharing such yummy foods with you all. how fun! i may have to check into starting something like this…or at least that babycare coop exchange thingy!! that also sounds dreamy dreamy!! i would love to know more about that…thanks. love this idea. and have really been wanting to make bread so here I go . . . thanks for the recipe. even here in bountiful san francisco, where yes, we can eat amazing local food year-round, it would be nice to share food with other mamas, especially those bulk items like granola. so thanks to this post, i leaned over to my co-worker (and friend and fellow mama) and we are going to try it–with her granola recipe first, and she kindly offered to be a guinea pig for my first attempt at bread-making. yay! so thanks! That’s how it starts! And truthfully, my first bread attempt with that recipe was rather puny and hockey-puckish, but hot and fresh and slathered with butter and from my own kitchen, pure delicious joy! Fantastic idea. I make great agave-sweetened granola and have been desperately wanting to get yogurt in glass bottles and not plastic (they are selling it at the co-op now but it costs $11 a bottle! Oy). Are you in Ashland? Any interest in granola?? If so, please email me!! Darn. If I were in Ashland, I would totally exchange some yogurt for your granola. A little yogurt FYI: I’ve made lots of yogurt with pasteurized milk, which always came out fine, but definitely on the runny side. This time, I used raw milk (heated to 110F before adding the yogurt culture) and not only is it super thick, but that cream layer on top? Swoonable! I think every mama’s party should have sippy cups & wine bottles! This looks like such a nurturing & encouraging tribe! You’ve given me some great ideas!! What a darn good idea! what a really great idea and a great circle you have there! I need to find recruits! What a fun small change, one that involves connecting and gathering and eating. Yum. yyyyes. i love it. that does it! i’m moving to durango. Ooooh how we loved on your meal last night mmmm mmmmm! And when we got home, we loved on your yogurt! What an indulgence ~.~ We’ll have to bring over Jojo’s apple kriyasp and share what your two creations do together! I’m definitely on that bread recipe too. Do you really need a container to bake in? I suppose you probly do. I can see that it is worthy. Thanks so much for spreading such goodness! I want in on this!!! I’m going to think of what I could make in mass quantity to share with you ladies!! This is really wonderful. Do you have room for another “wife”?